I found zucchini and cherry tomatoes on sale this week and made this as a side to my Kale and Bean Ragout. I could have eaten the whole thing, and it is so good for you! 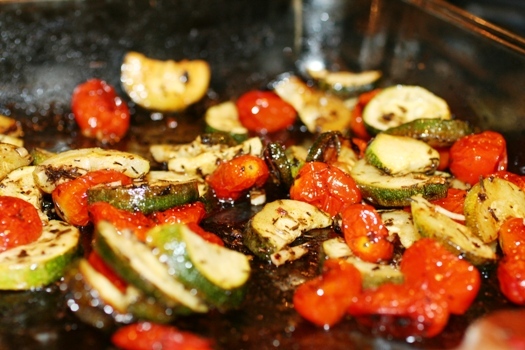 Toss zucchini and cherry tomatoes in marinade, then pour into a 9×13 glass dish. Cook in oven for about 15 minutes or until fully roasted. Recipe developed by Kelly Hancock ©2010 Faithful Provisions. For personal use only. May not be reproduced, reprinted or distributed for capital gain without prior permission from Kelly Hancock. .-= Cate´s last blog ..Seriously- =-. All I can say is YUUUUMMMMMMMMYYYYY! This looks so good, two of my favorite veggies. Can’t wait to try. The link to for the Greek Marinade seems to be dead. Any help would be great. THANKS! This sounds so good. I think I may even be able to get my husband to eat this! And he only likes green beans, corn and potatoes! Thanks for posting this!! I made it tonight with some cherry and grape tomatoes and a LARGE zucchini from my garden . It was GREAT!! YUMMY! !